Evolving the Techstars Community in Washington, D.C. The Techstars suite of startup programs are an amazing catalyst for startup communities. Its three core startup programs help engage people at various stages of the entrepreneur’s journey. However, sometimes the programs can fall into silos and lose the benefit of being part of a whole. So, what gives and is it critical for your city? Washington, D.C. was my formal introduction to the world of startups and entrepreneurship. In fact, Techstars Startup Weekend was one of the initial entry points. I was inspired to engage the community and give back by volunteering. As I got more involved, I saw there were complimentary programs like Techstars Startup Week and Techstars Startup Digest, but no one on the Weekend crew had much interaction with them. So I set out to see how to get more involved because, at the time, there were too many organizers in the Weekend crew already. I had to piece the connections myself, which undermines a cohesive startup community. Sometimes the programs can fall into silos and lose the benefit of being part of a whole. So what did I find? 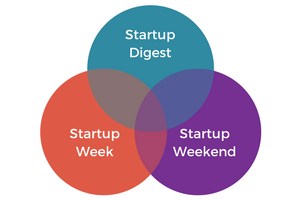 There was no Startup Week, there was a Startup Digest. One great thing about the Techstars Startup Programs is access to a regional manager to make connections and introductions. Just like they are able to serve as a connector, so too should the local community leaders. I had to piece the connections myself, which undermines a cohesive startup community. Startup Week was not active in the area, but someone else had reached out to them before me. At first, this felt like a setback, but in hindsight it was great because I wouldn’t have to do it alone. After the experience, I was glad to have help. Like Marc Nager taught us with Startup Weekend, don’t go it alone. There’s only so much a person can do, but with others involved, you can do so much more, like build a startup in 54 hours! Now I don’t know if anyone can relate, but a 5-day program that no one has seen or heard about before is not something incumbent leaders jump for joy about. I realized the uphill battle to get Startup Week credibility on the local stage, and leveraging the Startup Weekend network was critical. In hindsight, being part of the Startup Weekend crew already helped bridge the trust and collaboration gap that could have existed. Startup Week could have been left to its own devices. And let’s be clear, the Startup Weekend organizers are always willing to help, but their capacity is capped since everything we do is a labor of love; no Ferraris at the end of this tunnel. Another great thing about Techstars is the leadership development they make available. For our purposes, every year there’s a summit for all community leaders across its startup programs to provide training and share ideas across cities. Startup Digest in Washington, D.C. has a following of more than 5,600 subscribers. The thought of Startup Digest resurfaced during the 2016 summit, and I wanted to learn more and get involved. And in this case, there were already two curators overseeing Washington, D.C. Now here was the tough part, how was a small time upstart like myself going to begin the conversation and build trust to get in on the team? The regional manager made the connections and I was added to the local Startup Digest team. Success? Sort of. As with any team where someone new gets thrust upon them, it was a bit awkward at first. It took time to learn the ropes so to speak and build trust. Surprisingly the team was already looking to move on, so I became the lead curator shortly after my entry. Here’s where things got interesting. The Startup Digest in Washington, D.C. has a following of more than 5,600 subscribers. Imaging tapping into that to help promote Startup Weekend and Startup Week? All three programs now became circles that, if in silos would continue to grind away on their own, but if they converge even to a small extent they could support and bolster each other’s efforts. The Techstars Community concept came into play, something that Aldo Aguirre mentioned as we pushed to hold various events to co-promote the upcoming program initiatives. In fact, we surprised Aldo with a co-hosted rooftop social mixer to celebrate the various partners and entrepreneurs. And that’s just a tip of the iceberg. And that’s just a tip of the iceberg. For 2018, the collaborations have expanded to think up a calendar of events to move each program’s needle forward. Is this the direction all cities should follow? Not necessarily. It works for Washington, D.C. because in an area where the ecosystem is splintered and duplicative efforts are the norm, it just doesn’t make sense for the long game. As we continue to map out the Washington, D.C. ecosystem using the Startup Community Maturity Model, we need to become more collaborative to help mature the ecosystem into the next phase. I’m also in a unique position where I touch all three programs. This is not the norm across cities that I am aware of, so some unexpected challenges may come up. However, as we continue to ask Techstars to increase the support they provide, cross-functional collaboration is something we should consider at the local level. There’s only so much a person can do, but with others involved, you can do so much more, like build a startup in 54 hours! And as traditionally underrepresented groups become the new majority in the upcoming years, we need to be intentional about how we engage across programs and with limited resources to provide the best support for the next generation of startups and small businesses. This original post can be found on Meldium.